The media-hyped pro-Palestinian Authority “fly-in” has bombed out so far as airlines have canceled most of the activists’ tickets. The media-hyped pro-Palestinian Authority “fly-in” has bombed out so far as airlines have canceled most of the activists’ tickets to Ben Gurion International Airport. As of 8 a.m. Sunday, more than 600 police officers swarmed throughout the airport to handle mass protests by demonstrators, but so far, none of the pro-Arab protesters has landed. Most airlines canceled the activists' reservations rather than having to pay for their return following a warning from Israel that they would not be allowed to enter the country. "Usually airlines don't allow these people to embark, because then they have to cover the expense of the return flight," said Israeli Foreign Ministry spokesman Yigal Palmor. The low-cost Jet.2 airline canceled tickets for women scheduled to travel to Bethlehem from Manchester, according to the London Guardian. Jet.2 said it complied with Israel’s request for names, dates of birth, passport numbers and nationalities of the passengers. Israel then told the airline the passengers would not be allowed to enter the country because they would be considered security threats. Nearly 2,000 Europeans had planned to board airplanes for the “flytilla,” but most of them found themselves with canceled reservations. Lufthansa and Air France were among those airlines that told activists they could not board. The apparent failure of the fly-in follows previous failed attempts to bring in pro-Arab activists by land, ground and sea, an indication that the anti-Israel movement is losing steam. 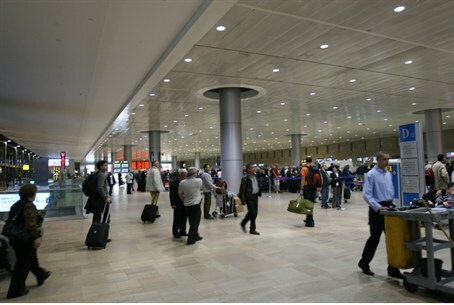 Last summer, most of a few hundred got no further than Ben Gurion International Airport, where they were sent back home at the airlines’ expense. “Million-man” marches on Israel also have been an embarrassment for supporters of the Palestinian Authority, as have sea flotillas. The office of Prime Minister Binyamin Netanyahu had prepared "thank you” letters for the activists, welcoming their interest to visit Israel to show their “humanitarian concerns” but suggesting they “could have chosen Syria, Iran and Hamas-controlled Gaza to express their enthusiasm for protecting people against abuses of freedom. "You could have chosen to protest the Syrian regime's daily savagery, but instead you chose to 'protest against Israel, the Middle East's sole democracy,'” the letter stated. Mainstream media still are hoping for a "media event" and Voice of Israel radio reported Sunday morning that although no activists have landed, perhaps the quiet was a "calm before the storm" that might erupt later in the day.